For those of you who follow me on Instagram you probably already saw the picture of this delish salad. It is quite possibly the perfect summer salad. 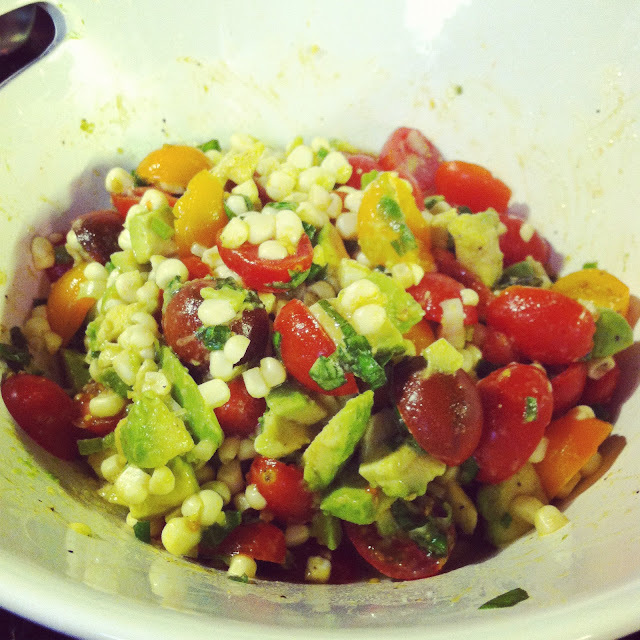 Ooozing with all the fresh flavors of summer- crispy corn, juicy heirloom tomatoes, creamy avocado and sweet basil. This might just become my go-to summer salad. Nothing has to be pre-cooked and it was so easy to whip together! We served ours with crab cakes and it was in my humble opinion an amazing meal! It would also pair great with chicken, shrimp, fish, or anything your heart desires. Make this light and tasty salad, I promise you will love it! this looks yummy! I might try this with chicken tonight. I'm not so sure I'm ready to tackle crab cakes yet. Too advanced for my skills! YUUMMM! Definitely adding this to my list of things to cook this summer. I have been dying for a recipe that is just this for summer, thank you! I do a corn salad with red and green pepper, cilantro, lime and white beans. It's so good and easy too! This is one of my go-to summer sides! SO good and so easy to make! this looks great! so you don't have to cook the corn??? This looks SO refreshing and SO good. This sounds delish and so so fresh for summer!! I make a rendition of this and it's delish! YUM! My mouth is watering. Can't wait to try this!! Almost made that the other night! Can't wait to try it and super easy! Girl! I am NOT even going to look at this recipe b/c I have had your tomato, bacon, avocado, and goat cheese sandwich every day since you blogged about it! That darn thing is soo freakin' good!!!!!!!!!!!! thank you :) Hubby had it for dinner tonight and he loved it too! Omg please come and cook for me!!!! This looks delicious and easy, my kind of recipe! This looks amazing! I can't wait to try it out. This is a salad to LOVE. online. In general leather handbags will suit the city or out on the town and they can look distinguished, omega speedmaster watches exceptional and royal at the same time. The fashion industry of these days sees ladies louis vuitton monogram canvas as one of the chief accessories. Addictions, Wedges, Wine, and Happenings. Do You Fancy a Margarita?